September 9 was HUGE and is continuing. Anyone relying on mainstream media wouldn’t know it, but the US prison system is shaking up right now. At least 29 prisons were affected. These are places where either prisoners reported to outside supporters, or where the authorities locked the institutions down probably because of protests. We expect this number to rise dramatically as we gather reports from prisoners and keep calling prisons in the coming days and weeks. More than 24,000 prisoners missed work. The facilities experiencing full shutdowns that we know about hold approximately 24,000 prisoners. There are probably thousands more who didn’t work that we don’t know about, yet. Many are still are not working today and intend to continue the strike until their demands are satisfied or the prisons break under the economic strain of operating without their slaves. This entry was posted in General and tagged incarcerated workers organizing committee, reportback, september 9th on September 14, 2016 by Prisoner Support. Compas, I greet you with insurrectionary love, that these words of war may reach you; greeting as well the coming days of insurrection, as ideas bloom in the fields like flowers we should not stop tending. But what hides behind this destructive war, behind the somber darkness of the human spirit? Is it not perhaps the reflection and poetic manifestation of beings taking back their lives and actively influencing the organization of the daily life? If each person that bragged about their “freedom” became aware of their condition, it would be the beginning of the last war, our last opportunity. I have learned that the potentials for a real force capable of opposing and negating capitalism are revealed in the course of the daily lives of the people. But generally, to cause one to reflect, a prisoner, for example, we find that simple words aren’t enough, because this is someone who lives in the war every day and who knows the landscape much better than we do and that doesn’t happen through words, but through real actions and attitudes that are in line with what we think and say. As even the most primitive living organism instinctively knows that if it is not capable of adapting to its environment it will eventually become extinct; the question would then be: Will the human be capable of adapting to the conditions of artificial life imposed on it by the techno-industrial environment? This entry was posted in General and tagged mexico, september 9th on August 27, 2016 by Prisoner Support. This entry was posted in General and tagged atlanta, prison rebells, september 9th on August 26, 2016 by Prisoner Support. 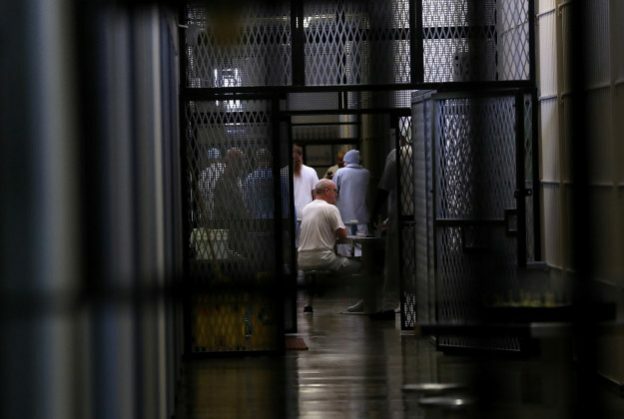 Prison officials recently placed Siddique Abdullah Hasan, a death row prisoner held at Ohio’s supermax, in segregation. Siddique was framed as a leader of the Lucasville prison uprising in 1993 and has been a vocal supporter of the September 9th national prisoner work stoppage. His segregation should really come as no surprise as prison (mis)managers have long waged a brutal war on truth and on the captives who tell it. What is disturbing and highly instructive is that Siddique’s segregation didn’t originate with the prison warden, but with the FBI. This further proves something I suspected in 2012 when prison officials segregated me and tortured me for having an “ideology.” While I was being tortured at a state prison, the FBI was on site. In fact, the FBI assisted by providing the Ohio prison system with training manuals on how to break me. Know where the training manuals were developed? The CIA. This entry was posted in General and tagged sean swain, september 9th on August 25, 2016 by Prisoner Support. Every time you see some major action being planned by prisoners, they always state that it is a “peaceful” and “non-violent” action. I think this is because a lot of Black prisoners who are basically behind a majority of these actions come from an Islamic/Black cultural nationalist background and it seems as if they look at the Civil Rights Movement as a model and frame of reference as opposed to the Black Liberation Movement, to which most claim to be heirs. They think it’s safer and can get more participation and good propaganda to induce those who adamantly oppose violence to get on board. I bring this up because a few ‘rades on the outside has brought it up recently and it’s constantly being debated by prisoners at Holman. It’s a debate that will keep rearing its head. 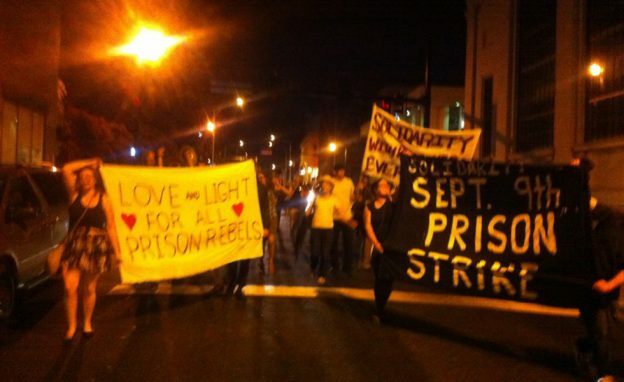 This entry was posted in General and tagged anarchist, Micheal Kimble, prison strike, september 9th, Southeast on August 13, 2016 by Prisoner Support. This entry was posted in General and tagged anarchist prisoners, FAM, free alabama movement, Micheal Kimble, prison strike, september 9th, Southeast on August 13, 2016 by Prisoner Support. In 2016, prisoners have called for nationwide strikes all across the country. As outside, we #ShutDownCityHallNYC (https://www.facebook.com/events/603110703195862/) and Holman square in Chicago, and as we tirelessly fight while our brothers and sisters are gunned down and incarcerated, inside people are fighting back. There is currently protests happening inside at Holman Prison in Alabama. IWOC NYC works directly with prisoners inside to develop demands, support struggles, and build for the September 9th strike as well as continuous action until all prisons are burned to the ground! We are led by people inside, and we work together on the outside as comrades. Come learn about the strikes, about IWOC, and how to get involved. This entry was posted in General and tagged action, holman, incarcerated workers organizing committee, IWOC, new york city, news, Northeast, september 9th, Solidarity action, support action on August 5, 2016 by Prisoner Support. Last night, Durham hosted a loud brass band concert benefiting a strike fund for prisoners joining up with the national strike in September. Folks distributed writings by prisoners and read their words over the mike in between songs. The show was capped off when a 17-piece brass band and banner-holders led a small march to the downtown jail. Prisoners responded by waving lighters or banging on their windows. The band finished off the march with a rousing and nostalgic rendition of “Pony” by Ginuwine. Really. In the next week there’s a teach-in scheduled with former prisoners on the history of prison resistance as well as another jail demo, this time hosted by Incarcerated Workers Organizing Committee folks. Both are geared towards raising awareness about the upcoming strike and getting folks pumped to be in the streets when September arrives. 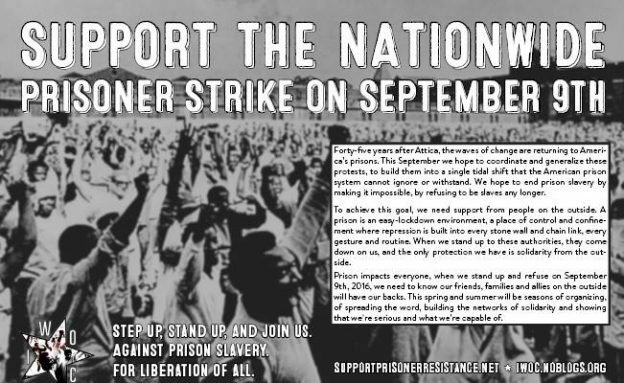 This entry was posted in General and tagged incarcerated workers organizing committee, IWOC, rally, september 9th, solidarity, Solidarity action, Southeast on August 5, 2016 by Prisoner Support. On August 2nd, an officer named Mark Royko with The Ohio State Highway Patrol went to Ohio State Penitentiary, had Siddique Abdullah Hasan pulled out of his cell and tried to question him about Sep 9. See Hasan’s summary of the conversation below. This officer used some pretty ridiculous terror-baiting language, so we are going to use this opportunity to remind everyone about some basic principles of security culture and anti-repression. 1. Do not talk to law enforcement. In the example below, Hasan was more open than we would advise anyone to be. As soon as you know the person you are talking to is a cop or a fed, walk away slowly. If they stop you, ask if you’re being detained. If they say yes, ask if you’re under arrest. In these states you’re obligated to by to give your name and show ID. In other states, if you’re driving a car or carrying a gun under an open or conceal carry permit, you’ll also need to show your ID. If you refuse to show your ID the cops, they might make up some “reasonable suspicion” pretext to arrest you, and the trouble of getting arrested and then getting it thrown out in court is maybe not worth it. States (colored red) in which Stop and Identify statutes are in effect as of February 20th, 2013. The cops can and do violate people’s rights all the damn time, and if you don’t want them to escalate and get violent with you, you might have to let them, just make sure you’re vocally asserting your rights (ideally before witnesses with cameras) while they trample them. If they ask to search you say “no” out loud but do not physically resist if they search you anyway. Say “i do not consent to this search” out loud. If they arrest you, do not talk. 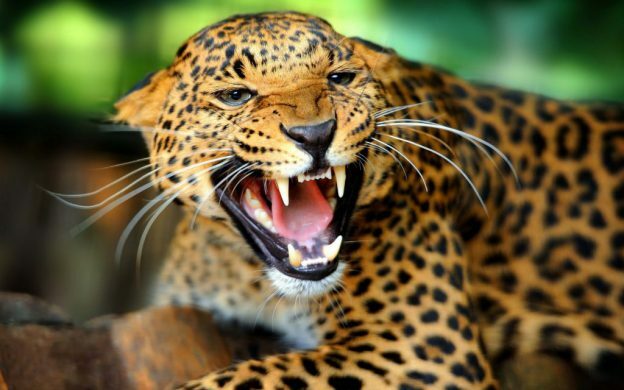 Remain silent and assert your right to a lawyer. Follow basic ACLU know your rights protocol. 2. Tell people. Once the police have left, write down notes describing the encounter as soon as possible. If you can, get names and badge numbers of the officers. Tell anyone you’re organizing with. 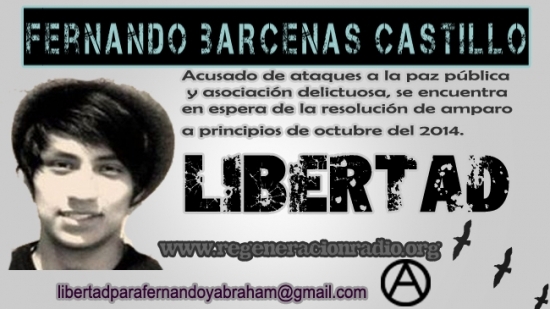 Email us at PrisonerResistance@gmail.com. Call IWOC Kansas City at 816-866-3808 or email iwoc@riseup.net. The more people know about law enforcement snooping around, the more safe we all are. This entry was posted in General and tagged anti-repression, court, september 9th, siddique abdullah hasan, tilted scales on August 4, 2016 by Prisoner Support.